I was lucky enough to receive another yummy Degustabox in September and one of the scrumptious food items was Reese’s Peanut Butter Cups. (We’re still getting through the other items but my box review will be up when we’ve tried it all). 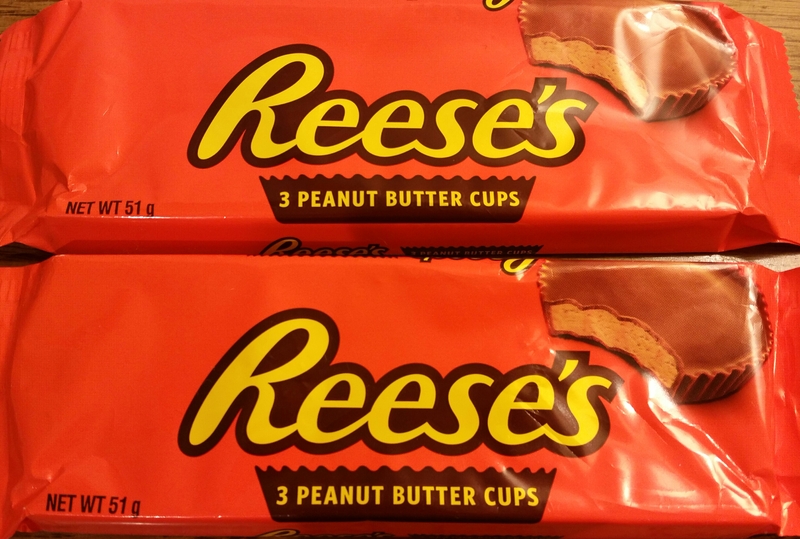 I was lucky enough to receive 2 packets of these peanut butter cups, and each packet contained 3 cups. I must admit, I had never tasted them before so was excited to try them. Chocolate covered peanut butter… heaven! Well, I liked them so much I had to buy more for this recipe! Line a deep cake tin with foil, getting rid of any big creases by pressing them down. Blitz the digestive biscuits in a food processor, or crush in a sandwich bag until there are no big chunks left. Mix in the caster sugar. Melt the butter and then pour on to the biscuit crumbs. Mix well and then transfer to the foil lined tin. Spread it all over the base and press down firmly with the back of a metal spoon. Place in fridge for 30 minutes to harden. Place the Reese’s peanut butter cups in a heatproof bowl and either melt over a pan of barely simmering water making sure the bottom of the bowl does not touch the water, or heat in the microwave checking every few seconds so they don’t burn. Stir the chocolate and peanut butter mixture well until it is all combined and is one colour. In a large bowl, beat the cream cheese until smooth. Add the icing sugar and continue to beat. Add the melted Reese’s cups and beat well until it is all combined. Add the cream and beat until the mixture thickens. Alternatively you can beat the cream in a separate bowl until soft peak stage, then fold it into the peanut butter cheesecake mixture. Pour the mixture on top of the biscuit base and spread evenly. Very gently heat the jam until it just starts to go liquidy, then sieve to remove any lumps of fruit. (You just want the “jelly”). 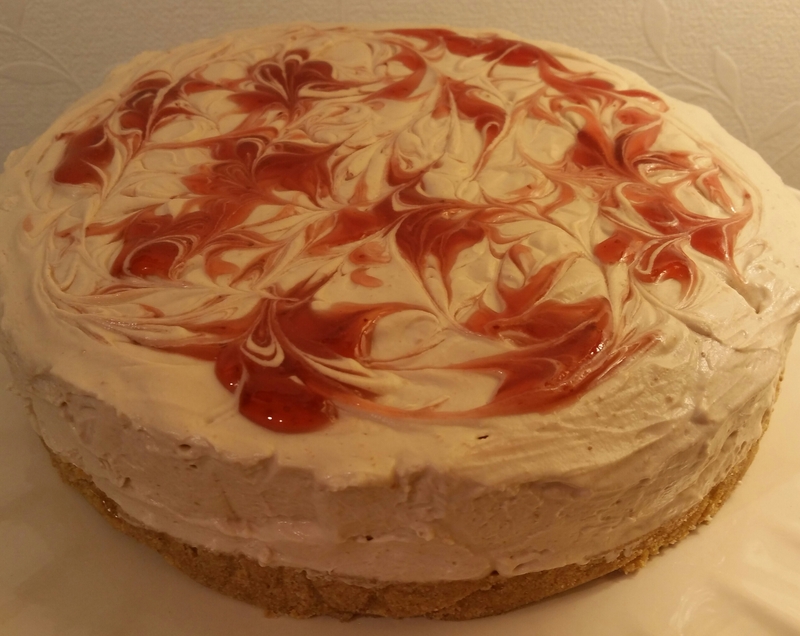 Use a teaspoon to drop little blobs of the jam on top of the cheesecake, then use a cocktail stick or skewer to make a swirly pattern. Place in fridge and chill for at least 4 hours until set. 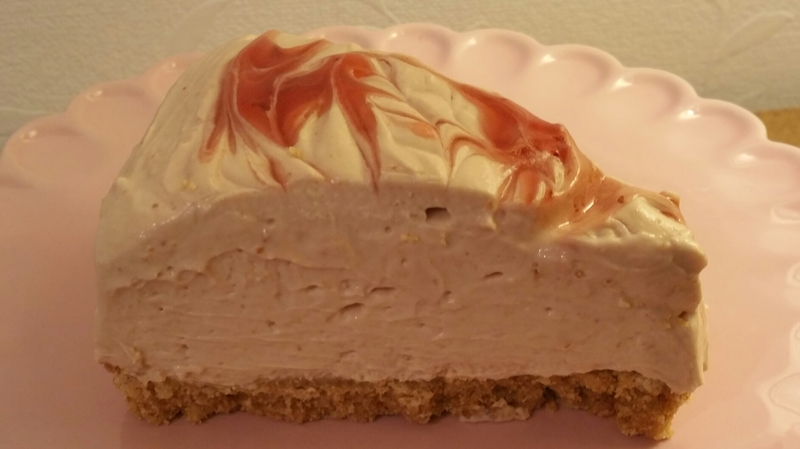 To remove, gently lift the foil out of the tin, peel away from cheesecake and serve.